Automated Sales Tax in QuickBooks Online makes calculating, collecting, tracking, and remitting sales tax more convenient. If you are currently using the Manual Sales Tax Center, QuickBooks gives you the option to migrate to Automated Sales Tax. An easy, 3-step process will get you all set in no time. This feature currently only supports companies that use accrual accounting. Read the FAQ section below to learn more. 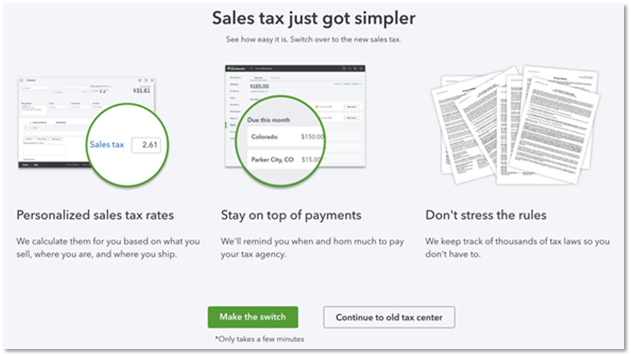 If you select Taxes from the left menu, you'll be directed to a page explaining the benefits of the Automated Sales Tax feature. Select Continue to old tax center if you want to stick with manual sales tax tracking. You will be asked to confirm that you don’t want to make the switch. You will also be asked for the reason, then you’ll be redirected to your existing sales tax center. Confirm your tax agency. On this screen, you will see the tax agency name you previously set up on your account and what it will be called going forward. If it's not, select the link I use a different tax agency then correct it. Select the appropriate filing frequency then Next. The setup is complete. You will see a confirmation that your migration is done along with a breakdown of the general sales tax rate(s) based on your company location. This page also explains that your rates will change based on shipping and special tax rules. Select Go to taxes to access your new sales tax center. Refer to Sales Tax Center Navigation if you need more information. What if my QuickBooks company uses cash basis accounting? Companies set up to use the cash basis accounting will not be able to switch to the Automated Sales Tax. The only way to switch a cash basis company is to set the company's accounting method to accrual. You can then activate Automated Sales Tax, and then revert back to cash basis accounting. What happens to my existing data after migration? You will not lose any transaction data after migration. Note: When you migrate to Auto Sales Tax, or if it is enabled on your brand new QuickBooks Online company, you'll see a Permit no. field on your checks and other expense transactions. There is currently no way to remove this field. If you don't want to see it on your transactions, let us know (Gear icon > Feedback). Will the sales tax amount on existing transactions change after moving to the new experience? No, existing transactions prior to migration date will not be affected. However, if an existing transaction is edited in a way that results in a change in the taxable total, automated sales tax will re-calculate the sales tax amount for that particular transaction. What should I do if I want to move back to manual sales tax? Select Sales tax settings at the top right. At the bottom of the screen, you'll see "Want to temporarily switch to the old tax center? Switch here." Select the here. You can still override the automated sales tax calculation on your sales transactions. If the override does not work and you still want to be removed from auto sales tax, contact Customer Care. Important: After disabling Automated Sales Tax, either by performing the steps above or contacting Customer Care, you can no longer re-enable the feature.